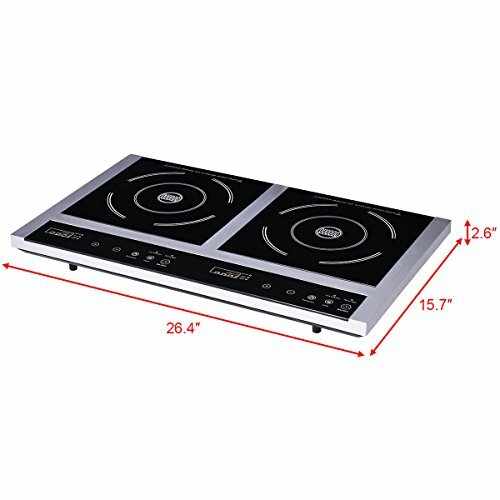 The portable double electric induction cooker is perfect for you. With timer and overheat protection, so that you can do other things when you use it and keep your safe. And it is quick heat up and cool down. 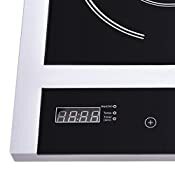 Temperature setting, digital LED display, and touch control make healthy cooking easier. 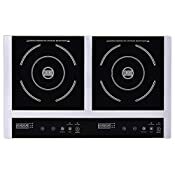 Besides, the induction cooking is compatible with most regular brands of cookware. Don't hesitate to buy it! 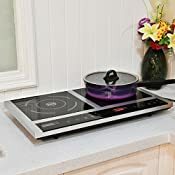 The bottom size of applicable pan: ɸ4.7" - ɸ10.3"
【Powerful Performance with 2 Burners】This induction cooktop will help you save much time doing kitchen tasks such as boil, simmer, deep-fry, and stir-fry, steam and sear, slow cook. 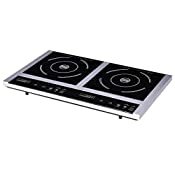 And the feature of dual burners is suitable for big families or restaurants. 【Digital Control Panel】Equipped with LED display and touch-screen control, you can set the power from 300W-1000W(left: 300W-1000W, right: 300W-800W), set the temperature from 140℉ to 460℉, and set count-down timer up to 175 minutes for a wide variety of foods and cooking methods. 【Built-in Lock】The lock is available to prevent tampering and changing of a set temperature, and it also prevents children from touching to protect their safety. 【Easy Handling】You can just wipe cooker clean using dish washing agent and a damp cloth. And the compact shape is easy for storage after it is thoroughly dry. 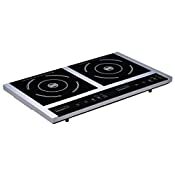 【User Friendly】The cooktop itself barely gets warm except directly under the cooking vessel. No more burned fingers, no more baked-on spills, you can use it without worry.